...... Attachments can be embedded in message body. Add MIME entities. You can set the message sender, add multiple message authors, add multiple Reply-To (singles and groups), add multiple primary, CC, and BCC recipients singles and groups. Authentication using the AUTH LOGIN mechanism. 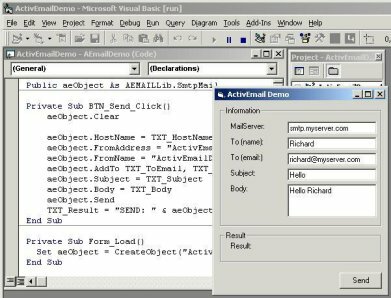 Qweas is providing links to ActiveEmail SMTP E-mail Development Kit 3.2 as a courtesy, and makes no representations regarding ActiveEmail SMTP E-mail Development Kit or any other applications or any information related thereto. Any questions, complaints or claims regarding this application ActiveEmail SMTP E-mail Development Kit 3.2 must be directed to the appropriate software vendor. You may click the publisher link of ActiveEmail SMTP E-mail Development Kit on the top of this page to get more details about the vendor.